Dog walking business reviews and referrals are like the engine in a car. If you’re missing the engine, the car might still look nice, but it’s not going to get you anywhere. Pet care relies on word-of-mouth. Would you leave your kid with a babysitter just because they took out a full-page ad in the local paper? Your criteria is probably a little stricter than that, and it’s the same with pet care. Building up a solid reputation from reviews and referrals is paramount to the success of your business. There are a few places people will go to find out more about a business, and you should make sure you’re present on all of them. Don’t just stick to one and call it a day, you’ve gotta spread yourself around like a bee pollenating everything in sight. We’re going to cover the big three: Google, Yelp, and Nextdoor. Each have their own market of millions, and each have their own advantages over the others. While their markets may overlap in many cases, it’s still a good idea to get on all three rather than putting all your efforts into one. Besides, when your users write a review, they may be users of a particular one, and if you’re not on it, you won’t get a review. The typical person won’t sign up to a new service just for you, unless you provide unbelievable service. If you don’t have a Google Business listing yet, what are you waiting for? We’ve written about advertising your dog walking business which gives some other useful tips. Start by creating your free Google Business listing. 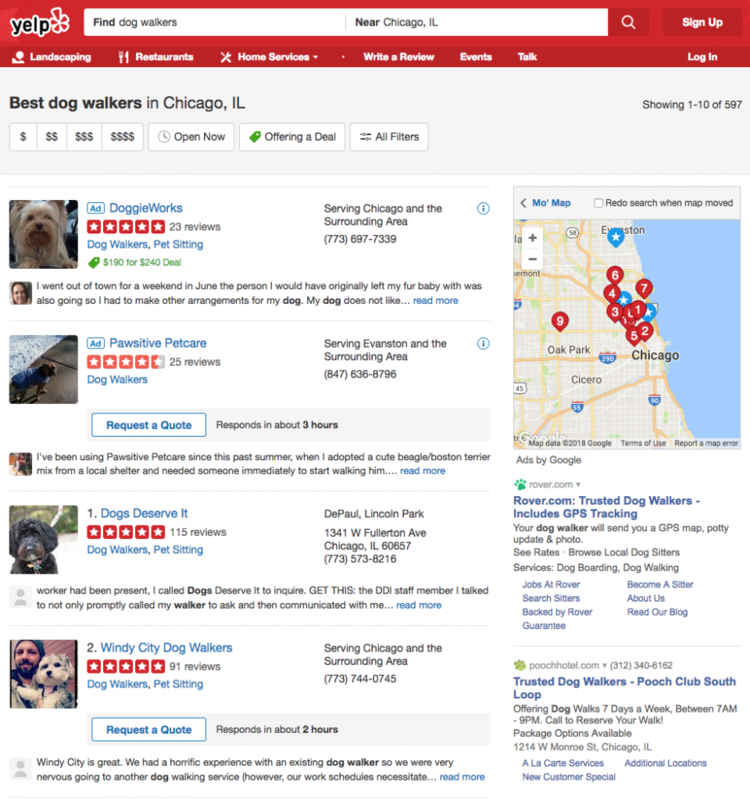 Not only does it give users an avenue to write your dog walking business reviews, but it also puts you on the map. In other words, when someone searches for “dog walkers near me”, if they happen to be close to you geographically, you’ll appear. That in itself is an incredible advertising opportunity, since it targets your entire market. Once you have your listing, anyone with a Google account (that’s a lot of people) can leave a review. 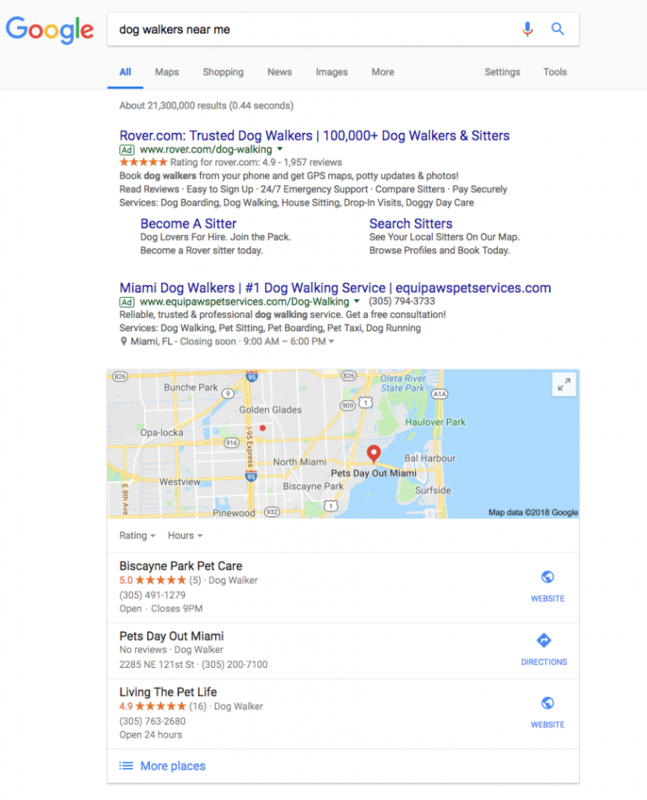 Regardless of your search engine optimization strategies, you’ll show up at the top of the results for people searching from your geographic area. Are Yelp ads worth paying for? How to figure it out. Yelp reviews are definitely one of the most useful reviews you can get. Do your research to see if paid ads are worth it. While it’s not exactly a review site, Nextdoor does allow people to recommend local businesses to their neighbors. Simply add your business on Nextdoor and your neighbors will be able to recommend it to everyone who lives in your neighborhood (and surrounding areas). This is extremely useful, since it only targets people close to you and serves as both a referral and a reference of sorts. 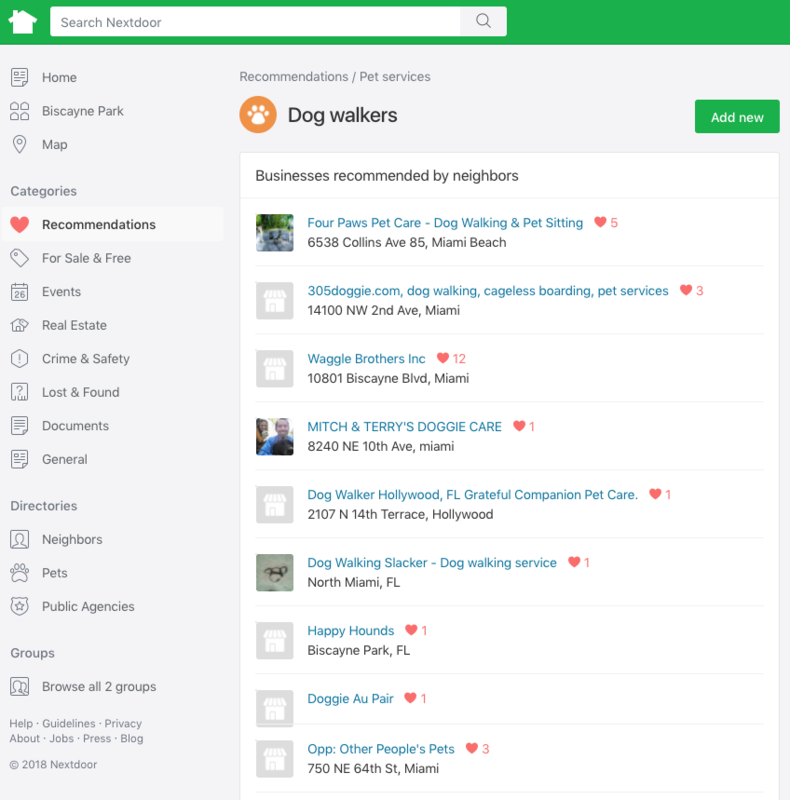 With one click, people in your area will be able to see what pet care professionals their neighbors recommend. We agree with Google on this. Yelp’s reasoning boils down to the way their recommendation algorithm works, to which we say: write a better algorithm. Google doesn’t seem to have a problem, so Yelp needs to step it up. At any rate, we recommend asking your customers to leave honest reviews. However, don’t incentivize your clients to leave a review since the FTC has deemed it illegal [PDF] to do so. Ask them in response to a praise. For example, if the customer tells you how happy you make their dog, let them know a review would really help you out. 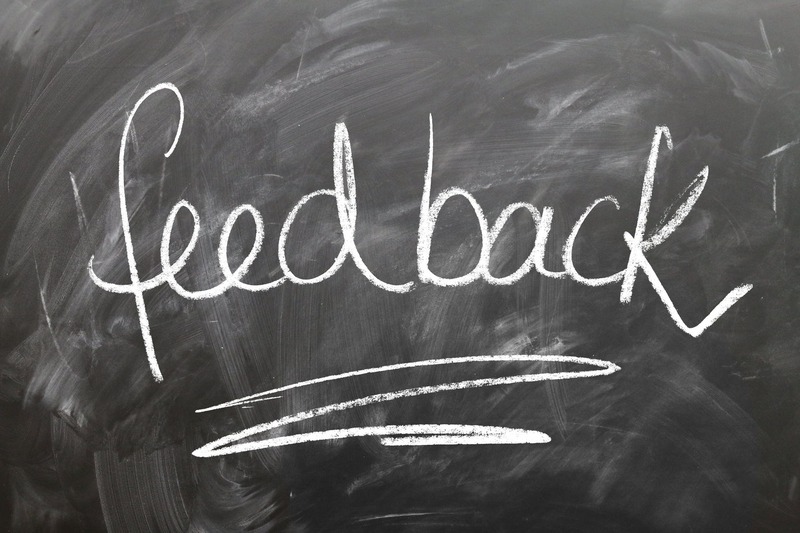 After their first couple of services with you, ask your customers to provide you with an honest review. Add a note on the footer of your outgoing emails about how you would appreciate a review. While incentivizing a review is something you should avoid, there’s nothing wrong with offering them a coupon with no strings attached, but adding a note about how you would appreciate a review. For example, you can send a holiday email with a coupon attached, and then end the email with “I would really appreciate if you can take a few minutes to leave me a review on Google”. Getting dog walking business reviews will increase trust in your business, so make sure you work on that as soon as possible and keep at it as you gain more customers.